Today was supposed to be the first day back to school for two out of three of our kids. But a cold front has come through, with a little moisture to go with it–in Georgia, where we live, that is reason enough to cancel school, apparently. So now I find myself with a bit of a gentle reprieve–an extra day to slow roll into our normal, frantic routine. It’s 7:30am as I am writing this post, and the house is still silent. Even the dog and cat are sleeping in. I have started my day with quiet sitting, sipping coffee and enjoying the hush of the house. Outside my window, the sky has changed from darkness to a bright, overcast grey. 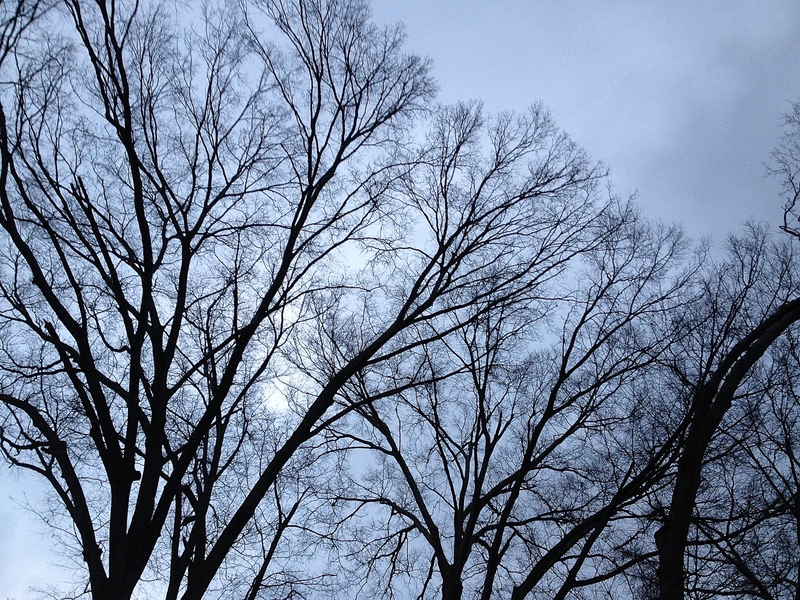 The view of the leafless trees is starkly beautiful. I have really appreciated this subtle shift in my mornings, which all started with a commitment to take time to take my time. In a similar spirit, I thought for today’s experiment I would see if I could start finding a moment–preferably in the midst of the rush of the day–to come to a stop. Again, I’m setting the bar low here–fifteen minutes will do just fine. Even if it means just turning off the computer in my office and looking out the window, or taking a fifteen minute detour that takes me off my hurried course, that should be enough. I will post below in comments later in the day to let you know how it goes! This entry was posted in Uncategorized and tagged being present, hectic, mindfulness, pace, simplicity, taking time. Bookmark the permalink. So I had a break between two classes today–a little longer than 15 minutes. I thought that would be a perfect opportunity to put a halt on the day. Normally, I would be rushing from one thing to the next, checking email, etc. Today, I sat in my office, in a seat I don’t normally sit in, looking out a window that I rarely take time to look out of. It definitely slowed me down and made my actions a bit more deliberate. The only problem was keeping back the crush of time; it was hard to fight the urge to look at a clock. I think I managed to get a good 8 or 9 minutes in…. not bad for a first go, I would say. Next time set an alarm so you don’t have to look at the clock until it sounds. It is amazing how even 5 or 10 minutes of consciously sitting and letting go of the events of the day can make a difference – I usually feel more refreshed, more grounded, and clearer in my thoughts. Thanks for pulling me back to this post and reminding me that I can do this one on any day, at any time, and just about anywhere! It’s a great trick, when I can remember to do it. So here we are, a year later, and what a welcome reminder that I can always come to a stop in the midst of my day, if only for a few minutes. In fact, I am going to that right now!